Only a few weeks into 2019, and I’ve already made the follow-up to CCGMS 2019. Announcing CCGMS Ultimate! 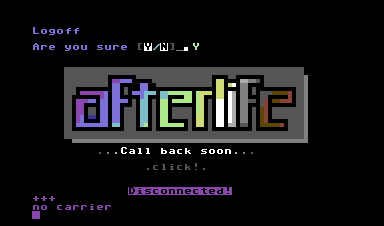 As the name implies, the latest major feature is full compatibility with the C64 Ultimate / Ultimate II+ Ethernet connection. Also some minor tweaks, improvements, and bug fixes in several other parts of the program. From what I can tell, this is about as good as I can get it. This includes the full program with all the drivers for all the modem types, so, no matter which modem type you are using, please upgrade your copy of CCGMS 2019 and use this instead. Posted in CCGMS, Term programs. 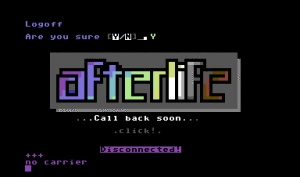 This is the same as the cracked version from Vendetta, with boot file fix, y2k fix, enhancements for wifi modems like the Strikelink WiFi (make sure to add/connect the DCD pin on the C64 to D4 on the nodemcu for Strikelink WiFi use). Still only 2400 baud, but tested and working. I may take a shot at adding Swiftlink drivers for faster speed in the future. I’ve already hacked the ml and know how the modem drivers work, just a matter of seeing if it plays nice with other modem types. The 2400 baud routines that originally come with this version of DS2 are the proper George Hug 2400 baud routines, so it’s solid at 2400. For original sysops who don’t want to use files from the Vendetta release, heres the y2k fix information. UPDATE: An original DS-2 11.6 disk has been confirmed to boot with this dongle. Thanks for sending that info in. Thanks to Hoy Brothers from 13th Floor BBS for sending me the results of tests on an original C-Net dongle. Between that, some cryptic info I found on old comp.sys.cbm posts, and lots and lots of testing, I figured it out. This should allow all those oldschool sysops who lost their original dongles (like me) to load their original C-Net disks again. Should work with various versions. Not sure about C-Net 128, but I’d love feedback from anyone who tries this to confirm different versions it runs on. My original C-Net 12.0 runs fantastic now. Parts needed: 4.7k ohm resistor (1/4 watt should be fine), 10uf non-polarized capacitor (5v minimum rating i assume), 1n4148 diode (the cheap ones you used to get in batches from radio shack), and a female 9-pin serial connector (for the joystick port). That’s it. Let me know how this works out for you. Remember it plugs into port 2. Posted in C= BBS News. Well, I finally figured it out, and it wasn’t that complex after all. Load CCGMS, use User Port 300-2400 and 2400 baud settings. As with all versions of vice, file transfers do not work. If you want to upload and download programs, get a real c64. 🙂 Or use CGTerm. They look pretty cool and come in a variety of colors. At this time, modems are still out of production, but I hope to resume in the near future. I’ve sold out of my current run of Strikelink Wifis. I hope to resume production in the near future. Please also feel free to send me errors and omissions. I want this to be a definitive resource. Thanks! Bo Zimmers' Classic BBS Software Retro Software – many still work with emulation!